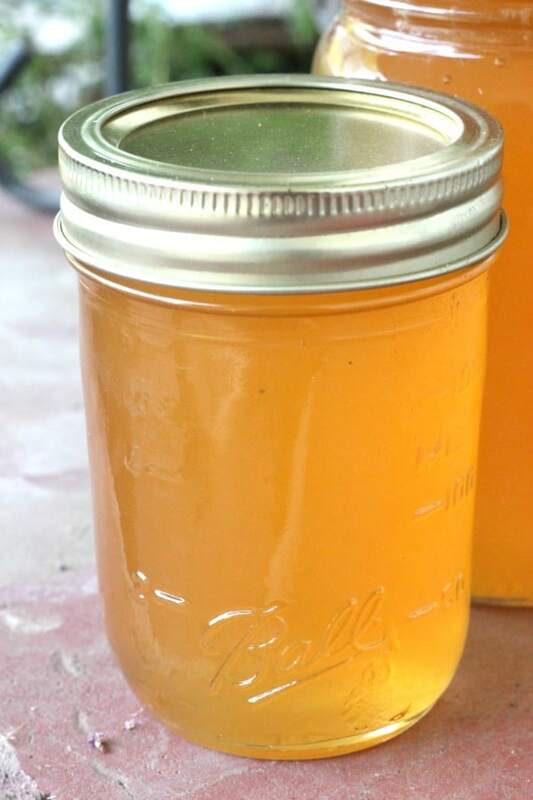 July 18, 2018 1 comment on "Apricot Jelly Canning Recipe"
I love making jam, I have been making all types of homemade jams for many years. It’s only been the last couple years that I have tried making homemade jelly Jelly takes a couple more steps to make than jam, but if you are not a big fan of seeds in your jam, then you definitely want to try making jelly. This apricot jelly recipe is really easy to make. It’s one of my favorite top 10 easy homemade jelly recipes for beginning canners. In case you are wondering what the difference is between jam and jelly, jam is made from whole fruits, which may or may not be peeled. If there are seeds in the fruit, then there will be seeds in the jam. Jams generally have chunks of fruit in them. Jelly is made by slightly cooking the fruit and then straining it to remove the juice from the fruit. The juice is then used to make the jelly, and the pulp from the fruit is either discarded or used for something else. A lot people who don’t like seeds in their jam prefer jelly over jam. Blackberry jelly is a great example. Most people don’t like all the crunchy blackberry seeds in their jam, so blackberry jelly is a great alternative. If you haven’t already, wash your apricots and chop them. There is no need to peel them. You need about 6 cups of chopped apricots. Place apricots in large stock pot with about 1 c. water to keep the apricots from sticking to the bottom of the pan. Bring to a boil and simmer for 10-15 minutes, or until apricots are soft. Extract juice from the apricots with a jelly bag or fine mesh strainer. If you have the time to wait, it’s best to let the apricots sit for a couple of hours or even over night to extract as much juice as possible. 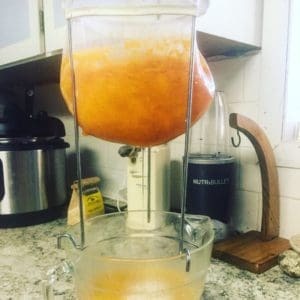 If you are using a jelly bag, resist the urge to squeeze the bag or you will end up with apricot pulp in your jelly (which is not a huge deal if you are short on time and want to help it along). Measure juice, adding a little water if necessary to get exactly 3 1/2 cups of juice. Pour the apricot juice into a large stock pot. Sprinkle the pectin on top of the juice and use a whisk to mix it together. Stirring constantly, heat until boiling. Boil for one minute. Add the butter and return to a boil. The butter is optional but helps reduce foaming. Add the sugar to the pot all at one time (measure it and have it ready ahead of time). Stir until the sugar is dissolved. Return the mixture to a boil and boil for one minute. Place the jars in the boiling water canner and make sure they are covered with at least 1 inch of water. Bring water to a boil and process the jars for 5 minutes. Note: Jelly can take from several hours to several days to completely set. Place the jars on a towel on the kitchen counter to cool and don’t disturb them for several days so the jelly has time to set. I let mine set overnight and it was done by morning. If after several days the jelly is still not set, then follow these instructions. If you have any jars that did not seal place them in the refrigerator to eat in the next month or two. Sealed jars can be stored in the pantry for 1-2 years. 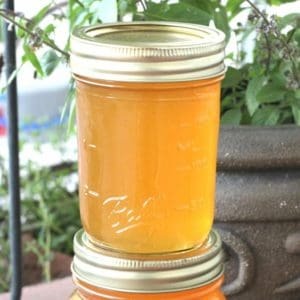 1 Comment on "Apricot Jelly Canning Recipe"
I am not really big on apricot jelly as a standalone, but mixed with store-bought bbq sauce and a dash of sriacha hot sauce? You have some good mopping sauce right there. Thanks for sharing this recipe!